Welcome to 4K UHD Blu-ray era. After Blu-ray beats DVD to become the main physical media. It is gradually replaced by UHD 4K Blu-ray now. It’s the latest generation of Blu-ray discs which, as the name suggests, supports Ultra HD – aka 4K. 4K Blu-ray playback is a headache right now for many people cause 4K Blu-ray is HEVC codec, aacs 2.0 encryption and 4K resolution, which has high requirements on the media player. So to play 4K Blu-ray conveniently, we instruct you to rip 4K Blu-ray to multi-track MP4 with multiple subtitle and audio keeping. As we said, 4K Blu-ray is protected by AACS 2.0 and encoded with HEVC codec. So your Blu-ray Ripper needs to be able to bypass UHD Blu-ray AACS 2.0 encryption and decode HEVC to H.264 or decode 4K HEVC Blu-ray to HEVC MKV/MP4 files. Here, we strongly recommend you Pavtube Bytecopy which is the best professional Blu-ray ripping tool developed by Pavtube Studio, which is updated frequently to support to decrypt the newest Blu-ray encryption mechanism. Now, it is updated to 4.9.1.0 and supports to crack Blu-ray AACS, BD+, UOP up to MKB v62.2 and AACS 2.0 somtimes. – rip 4K Blu-ray to lossless/uncompressed MKV on Windows 10. – rip 4K Blu-ray to MP4/MOV/AVI with multiple subtitle and audio tracks. – Compress 4K Blu-ray to 1080p video. 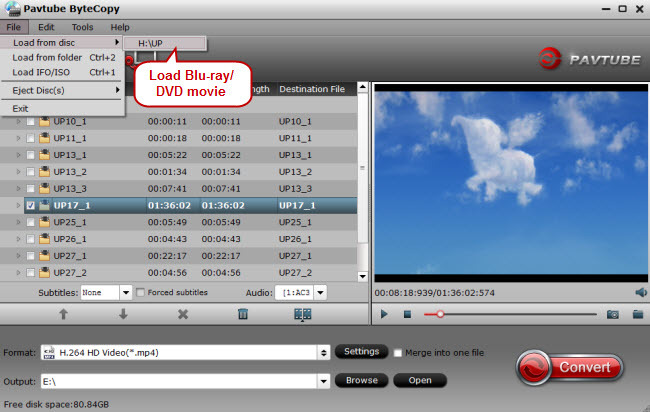 – Convert Blu-ray to SD/HD/4K MP4, MKV, AVI, WMV, FLV, TS, MPEG, etc. What’s more, it supports the newest NVIDIA HEVC encoder speed. So when you try to rip 4K Blu-ray to HEVC and AVC video, you can get up to 30x times 4K blu-ray ripping speed with NVIDIA CUDA hardware acceleration. Step 2: Output Multi-track MP4 format. 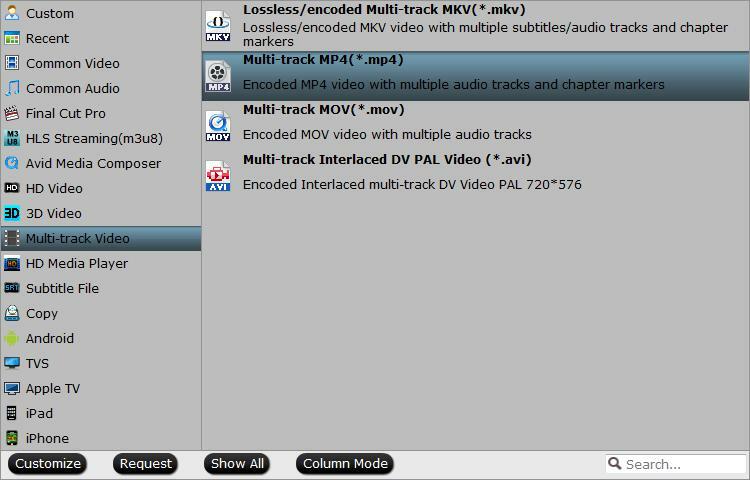 Click the format bar to follow “Multi-track Video” and “Multi-track MP4 (*.mp4)” because it will contain multiple audio tracks and chapter markers in the output video. Tip: Click “Settings” on the main interface to open “Multi-task Settings” window, all audio tracks from the source files are checked and to be saved in the output MP4 container by default, if there are some audio tracks you don’t like, uncheck and remove them under the “Audio” tab. Now, move your cursor to “Tools” button on the top of the main interface to choose “Options”. Then you can enable GPU Encode acceleration. You need to check if your graphic card supports CUDA acceleration from here. . Step 4: Start 4K Blu-ray to multi-track MP4 converting. After finishing all the settings, go back to the main interface, press the right-bottom “Convert” button to start 4K Blu-ray to mp4 with multiple audio tracks conversion process. When the conversion is completed, click “Open output folder”, a window will pop out with all your converted files. You can then enjoy them on your favorite HD media players with your desired audio tracks. This entry was posted in Blu-ray, Blu-ray/DVD Ripping, MP4.